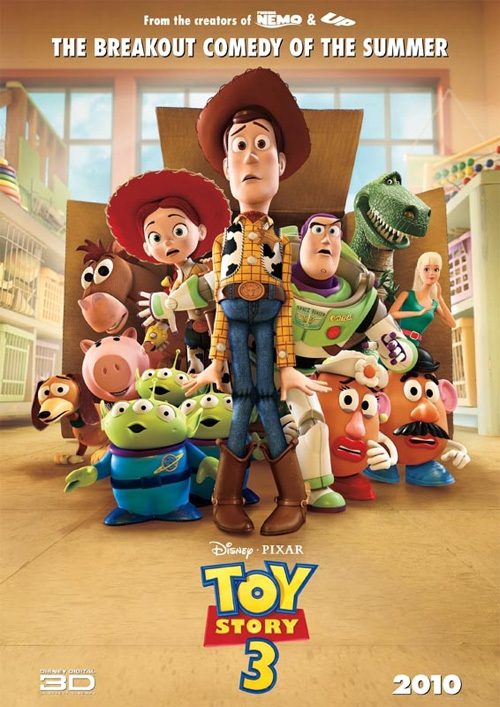 Although we originally said that the poster we featured a week ago was the "final" poster for Pixar's Toy Story 3, that doesn't look to be the case (and I'm sure there are still more coming). Empire has debuted another new (UK) poster for Toy Story 3 with one of the most clever taglines we've seen in a while. And if you don't get it, well maybe you should go watch some of the trailers again. Anyway, Disney packs in just about every character they can on this, at least all the main guys, which is impressive considering the last one did that as well and it left no room for anything else on the poster. Check out the new poster below. Toy Story 3 is being directed by Lee Unkrich, another one of Pixar's creative masterminds who previously co-directed Toy Story 2, Monsters, Inc., and Finding Nemo. The screenplay was written by Michael Arndt, the Oscar winning screenwriter of Little Miss Sunshine who is a newcomer to the Pixar family. Disney will be bringing Pixar's Toy Story 3 to theaters everywhere in digital 3D starting on June 18th this summer. @ #2, the story looks nothing like the previous one! Are u serious, number 2 Woddy was "Stolen" and the rest rescue him, this one all the toys are "GIVEN" to a daycare centre and they want to escape to go back to Andy. What an idiot. #3 there's no reason for the name calling. I....I just....I love pixar.....this poster has more character, promise, energy, laughs and anticipation than all of Dreamworks last 10 animation projects combined. Awesome poster. since when Andy has a Barbie? I love Pixar movies and Toy Story 3 looks great. They did a great job on the first two so I hope the third one is just as good. The only one whos missing peeking into the window would be the Grinch ;). In a few years we wll tak about the 6th part I guess.